Alright people. I just finished typing up a blog post for each of our vacation days, and they'll slowly roll out over the next couple weeks. I was going to try and combine days, but there were just too many things that I wanted to remember, so each day ended up having it's own post. Sorry in advance for all the words! It really was such a fun trip, but it is nice to be home, and even nicer being home and having Brandon back! I was in such a good mood when we came home from work last night that I don't think he quite knew what to do with me. And it feels good to sort of have a purpose again. I'm not working right now, and with him gone I didn't feel like there was any point to cooking or cleaning, and for some weird reason it feels good to do those things again! It must be the nesting side of me. Tomorrow we'll hit week 25 of the pregnancy! My favorite thing has definitely been having Brandon home so that he can feel the baby moving! The day he left for California, he got to feel him move for the first time. It was small, but still so special. Then, when I was in Logan visiting family, I felt the babe kick really hard for the first time, and was so excited for Brandon to come back so he could feel it too! He (the baby) moves really consistently every night when we lay down for bed. Also when I eat ice cream, which honestly has not been that much throughout the pregnancy. The week of my birthday, the week before we found out we were pregnant, I had ice cream like four or five times, and since then I haven't really wanted it. I think I've had ice cream maybe five or six times since then, and usually it's because Brandon's guilts me into eating some with him haha. It's so weird! Honestly, all growing up I just imagined that I would get super fat when I got pregnant, because I already love eating anyway, and eating for two sounds like the perfect excuse, but I haven't really been much hungrier than I was before. I think it was hard on vacation, because it was hot that I almost didn't want to eat. But my cravings for salty, processed potatoes hasn't gone away. We've moved on from tater tots to french fries though. And also, sweet potato fries. Those are my very favorite right now! Besides a tiny bit of sickness on the second half of the trip, I have been feeling great. 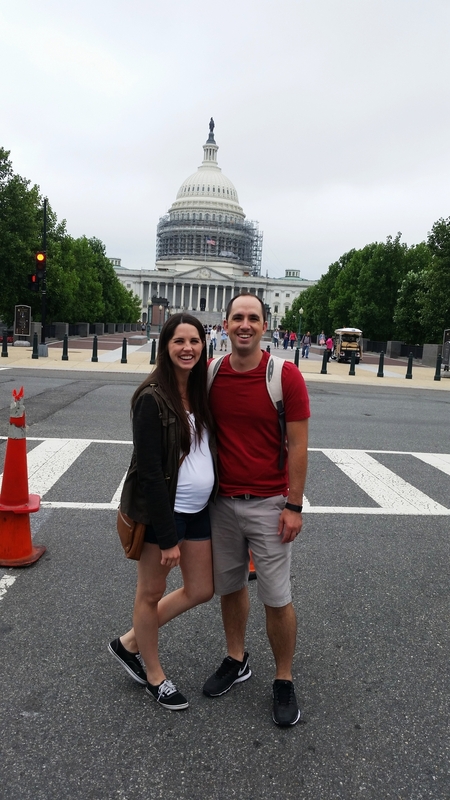 I'm actually really surprised at how well DC was, because I thought being five months pregnant would make vacationing a little harder. 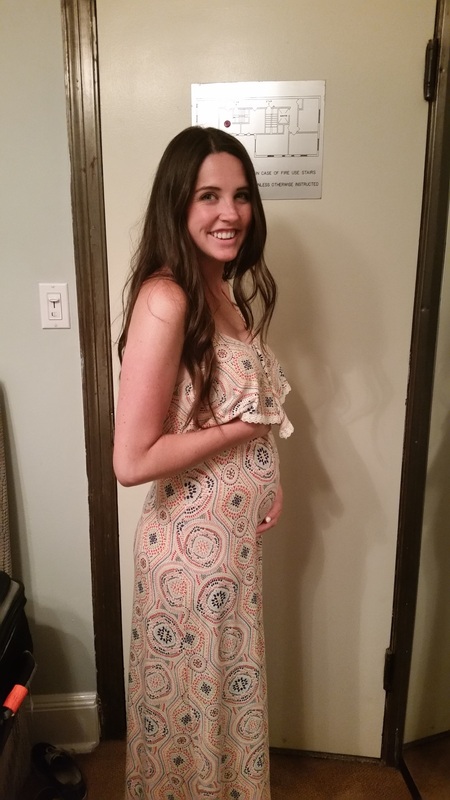 Brandon said, if anything, he feels like the pregnancy has given me more energy. I don't know if he meant that as a good thing or bad thing haha. We have our next appointment in two weeks, and I'm pretty sure I'm going to have to take the glucose test then, so I'm not really looking forward to it, but mostly because I'll have to get my blood drawn again and I hate that. Some people from Lewis and Clark (my old place of work that I miss so much!) had asked for bump pictures occasionally. 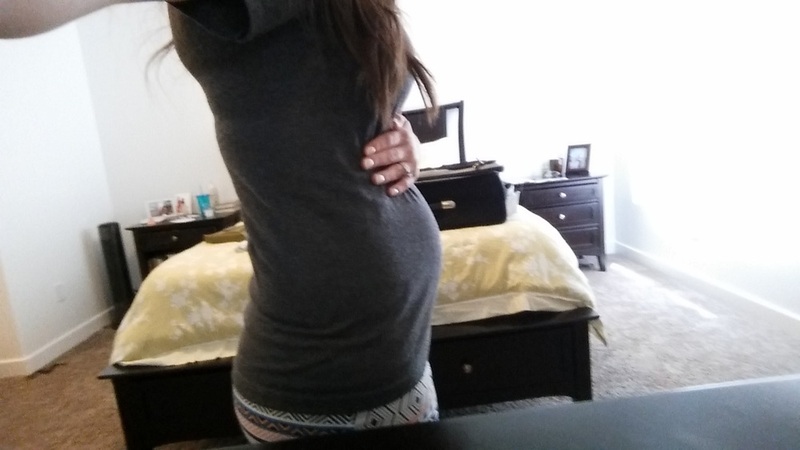 Until recently, I hadn't felt like there was much of a "bump," just like, maybe a large pizza or seventeen tacos stuffed into my stomach. I finally am feeling the bump though, and even had a few people offer me a seat on the subway because I actually looked pregnant. Anyway, I'm not really the kind of person to take belly pictures for the sake of belly pictures because, let's be honest, no one needs to be subjected to that, but here are a few pictures from the vacation that kind of show off the belly. I figure I should document this pregnancy at least a little bit. side note: the pictures from vacation make me look bigger than I actually am. the one in the white shirt, my back is arched, and the others are due to heat, and eating out. not that it matters. the bigger, the better, right? The weird thing is, unless I am really full from eating or have to go to the bathroom, he sits super low, like in the first picture. The pictures from vacation really aren't that accurate, because now, after having been home a few days and going back to a regular sleep and eating schedule, I'm not as bloated as I was on vacation. But the pictures are still fun to look at and see what I will look like here in a few weeks! This was pre-vacation, so halfway through week 22. Week 24. I felt super pregnant that day and sent this to my mom.